August 1, 2016 – In this episode, our time machine takes us out to the ballgame, where we’ll root, root, root for the Brooklyn Dodgers. The year is 1947, and Dem Bums just signed Jackie Robinson, the first African-American player in Major League History. Sitting next to us in the 50¢ grandstand seats, is Geoff Griffin, author of the children’s book, Brooklyn Bat Boy: A Story of the 1947 Season that Changed Baseball Forever . 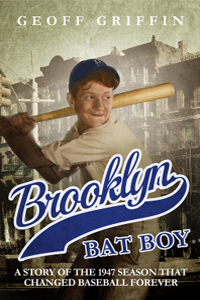 In it, young readers will witness the challenges Robinson faced through the eyes of 12-year-old Bobby Kelly — the bat boy in the title. For more, visit BrooklynBatBoyDot.com, Facebook.com/BrooklynBatBoy, @BrooklynBatBoy on Twitter and Instagram.